With the monsoon comes rain and with rain comes mud. 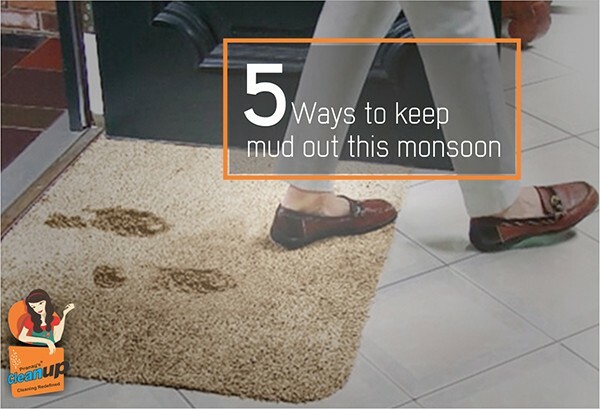 In the Mud Series, we’ll explore many mud related issues such as children hygiene, pet grooming, mud stain removal and first and foremost how to keep the mud out this monsoon. 1. Remove your shoes at the door. Request your family and friends to remove their shoes upon entering the house or just outside the door. You can also incorporate a similar policy at your work place. 2. Use a mat. Prefer rubber a mat for placing outside the door. This is a very effective way and most of the mud on the soles of the shoes of guests gets trapped on these before they enter the house. It is preferable to use rubber doormats for the outdoors since they can easily be cleaned with a hose pipe. It is recommended to use dark colours like black, grey, brown, dark blue for your mats to make stains less conspicuous. 3. Place rugs at the entrance. Decorate the entrance with stylish rugs to catch any stray mud and dirt from the shoes of anyone entering the house. You can also use old towels which are likely to soak more easily. 4. Close the windows and doors. Keep the windows and doors closed so that the dirt does not enter the house with the wind. 5. If there is any dirt in the house, use Grass brooms for dry mud and Spin mops for wet mud. Tune in next week for the second episode of our monsoon special MUD SERIES.